We’d love your help. Let us know what’s wrong with this preview of Spellbinder by L.J. Smith. Blaise's black magic is powerful. The only way Thea can fight back is to use her own white magic, to bewitch Eric herself as a bluff. But soon Thea finds herself getting too close to Eric, feeling forbidden emotions, breaking Night World laws by falling in love. As halloween and the Night of the Witch draw closer, can Thea save Eric and herself from Blaise's revenge? To ask other readers questions about Spellbinder, please sign up. I have into read it yet? Once again, I must have accidentally taken this book off my “Read” shelf. Had to add it back. If it weren't for my Unfinished Series Challenge I wouldn't even consider going on with this series. I ABSOLUTLEY LOVE HER BOOKS. THIS IS WAY BETTER THAN TWILIGHT AND NOT AS SEXUAL AND MORE INTO THE VAMPIRE STUFF AND IT HAS WEREWOLFS AND SUCH!! ILOVE THIS SERIES!! All in all this book was just really great, just enough romance and just enough adventure, the way she describes the witchcraft and makes u feel part of the powerful magic that takes place. Again characters mentioned for a moment in a previous book end up as the main characters in this book. 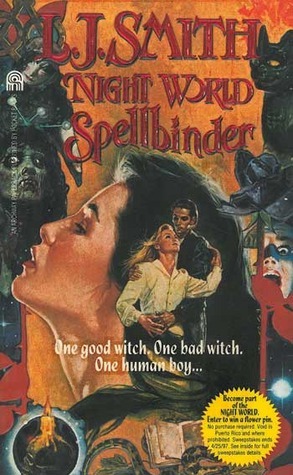 This book is about witches instead of vampires, which threw me off for a little bit, but I found that I liked it very much as more lore was added to the Night World series with this installation and more characters for future books were introduced as well. It was okay, I would've loved to see a couple chapters from Blaise' s POV but I thought the plot of this book was better than the previous night world stories. I really enjoyed the contrast between good and bad, white and black, Thea and Blaise. I think these books would be really good for an eleven or twelve year old maybe just starting to get into paranormal fiction or young adult. A good book, not as spellbilding as the two before, but still a must read! 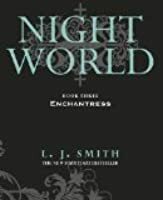 Enchantress is book 3 in the Night World series. It isn't one of my favourites but we do start to realise that something big is going to happen. We are also introduced to Circle Daybreak. It was one of the scariest words a high school senior could think of, and it kept ringing in Thea Harman’s mind as her grandmother’s car approached the school building. 1. Never let them find out the Night World exists. 2. Never fall in love with one of them. These stories are about what happens when the rules are broken. After moving to yet another new school after Thea’s cousin Blaise gets them kicked out, and with strict instructions not to get into trouble by their grandmother. This gets broken as soon as they turn up at school; when Thea spots a rattlesnake and tries to get rid of it when Eric turns up. Eric a popular, sporty, smart, yet shy boy turns up to protect Thea; but gets bitten, thus Thea uses magic to heal him only to find out their soulmates. This then leads to Thea trying multiple this to stop Eric from loving her, so he wont get killed... or her. While trying to stop Blaise from killing him too. But in one of her attempts she lets out an angry sprite of a witch who wants revenge. Thea has to rectify her mistakes, while protecting Eric, and hoping her Grandmother/Elders don’t find out. She is a her wits end. It was meaty. It had a lot going on at once, and a lot of suspension. Eric is so adorable too. Thea is relatable. It had the same instant love like Secret Vampire, I can forgive it for the great story, but it could have been slower. It was enjoyable, I liked it much more that Daughters Of Darkness, and Secret Vampire. Fazem algumas horas que terminei de ler Spellbinder, de LJ Smith, e não sei bem o que pensar. Não sei o que pensar pois esta foi uma experiência totalmente nova para mim. Eu sempre espero que os livros da autora sejam fluidos e dinâmicos, mas lineares. Aceito totalmente o clima New Age do seu sobrenatural, pois sei que ela vai saber me levar por caminhos "seguros" para mim... Mas mão foi isto que aconteceu desta vez. Desta vez, o passeio foi selvagem. Ao dar um descanso nos seus Vampiros, LJ Smith Fazem algumas horas que terminei de ler Spellbinder, de LJ Smith, e não sei bem o que pensar. Ao dar um descanso nos seus Vampiros, LJ Smith pôde explorar todo um universo novo e interessante: As Bruxas. E isto não foi apenas um novo fôlego para a série Night World. Na verdade, ela pôde explorar muito mais a dualidade de seus personagens - nem sempre certos, mas nunca vilões - como também conseguiu falar de forma bem moderna assuntos ainda super atuais, e que ela já mostrava conhecimento de causa em um livro de 1996. Como disse antes, esta foi uma leitura que me deixou em êxtase do começo ao fim. Não sei bem precisar em que momento percebi que está seria uma viagem diferente, mas quando dei por mim, virava páginas e capítulos com medo do que estava por vir. Thea and Blaise grew up like sisters, but the girls were different as day and night. While Thea was peaceful and an animal healer, Blaise was a first’class trouble maker and boys killer. Almost literally. After being expelled five times from different schools, Thea is determinated to make Blaise behave and allow both of them to finish their studies. The problem is that Blaise is not cooperating and can’t wait to play with her new human toys, as she seems the non-magical people. Things get worse when she targets Eric, the only boy that ever made Thea’s heart beat in a different rhythm. In order to protect Eric, Thea must pretend that she is interested in charming him and make him fall in love with her, just like Blaise would do. No harm done, no witch laws broke. The only problem was that Thea had already fallen for him. But as it went in Spellbinder, I was spechless when realized that I loved Thea, the sweet and naïve young adult protagonist of the story. I usually get bored with good girls, but she was so real and nice that I just felt like being her friend. Just like Blaise and Dani, Thea’s friend from the school and witch sister. My heart was tore, as I didn’t know if I cheered for Thea or Blaise to get what they wanted. I had never felt like this towards a protagonist and an antagonist: I always pick a side. I was a mess while reading, as the only thing that I knew for certain was that Eric made the cut for my infamous bookish boyfriend list, haha! And there is Blaise. She was awesome, I wish I could grow up and be just like her, seriously. She’s fearless and wild, beautiful to the point of pain (literally if you are a boy, be prepared) and very mature despite her bad taste for plays and tricks. Besides, she can craft anything like no one in the world. I would have loved to see myself her jewelry <3 And the most amazing thing in all of this is that her craft is a human ability – the itens that she made could have magic powers thanks to the pieces that she used, but the designs weren’t humanly impossible. Overall, this is another perfect young adult book with a supernatural romance and witches. If you like at least one of these elements, you just need to read this book. No, I’m lying. YOU HAVE TO READ THIS SERIES BECAUSE IT IS PERFECT! I wasn't as much of a fan of this story. It feels like they're getting a bit repetitive, which is okay but I'm not even halfway through the series, and that worries me some. I also didn't care as much about the characters. I did find the backstory on the witches of the Night World really interesting, and I liked the bits with any kind of spell work. I just wish there was more of that, and more of the coven. Overall I'm still enjoying these, and I am intrigued by the synopsis of the next one but I I wasn't as much of a fan of this story. It feels like they're getting a bit repetitive, which is okay but I'm not even halfway through the series, and that worries me some. I also didn't care as much about the characters. Wouldn’t it be nice to get that electric feeling, knowing that that person is your soulmate? Is that what it really feels like? I obviously haven’t found my soulmate, but hey who knows those who have may know the feeling. Not my favorite book in the series. It started out slow in my opinion, but somehow got much better towards the end. As usual, it came with somewhat uneventful story building, and quick, sort of simple and easy solutions and conclusion. Like always, still a fun read. So 3.5 stars. Not my favorite book in the series. It started out slow in my opinion, but somehow got much better towards the end. As usual, it came with somewhat uneventful story building, and quick, sort of simple and easy solutions and conclusion. Like always, still a fun read. So great for teenagers and young adults to enjoy, and just all around fun for older YA lovers. Who believes in soul mates? Blaise could kill me with a Look and I’d thank her for it. Whew, what an icon. I really liked this one! Thea and Eric were so cute. I love the take on witches in this story. The female protagonist, Thea, is a witch who has been orphaned and kicked out of a few schools due to the trouble caused by her cousin, also a witch and also an orphan. The story begins with them going to a new school. On the first day of school Thea saves a guy from a snake bite by using her cousin's bloodstone. During the exchange she feels a strange 'connection' with him. She starts to fall in love with him, which naturally is forbiddon, and things are only made worse when Thea's cousin decid The female protagonist, Thea, is a witch who has been orphaned and kicked out of a few schools due to the trouble caused by her cousin, also a witch and also an orphan. The story begins with them going to a new school. On the first day of school Thea saves a guy from a snake bite by using her cousin's bloodstone. During the exchange she feels a strange 'connection' with him. She starts to fall in love with him, which naturally is forbiddon, and things are only made worse when Thea's cousin decides to get involved, and when a summoning spell goes wrong and a vengeful spirit is unleashed. Source: I own a bind up of books 1, 2 and 3 in this series. This was not my favourite. But I think because the whole love element of this story was a lot more pronounced within this one. And I think I'm becoming cynical when it comes to love stories. Thank you PC Cast. Appreciate it. Další kniha ze série Říše temnot, která se mi líbila. Byla to oddechovka, u které jsem nemusela přemýšlet. Jediné co mi na knize vadilo bylo to, že tam nebyla skoro žádná akce ani napětí. Tahle série se vlastně motá hlavně kolem romantické pletky nebo-li spřízněné duši. I když se mi to líbilo, byl to asi nejslabší díl z těch tří, které jsem zatím četla. I like how L.J. Smith binds the lore into her books. By the end, you know that there all kind of supernatural being out there. The only thing I miss from this series is to know what happened to the characters from the previous parts. I hope there will be a bigger story behind it all. Tredje delen i Nattens Värld var inte lika bra som dom två första (Att lura döden & Nattens Döttrar), man fastnade inte r historien lika mycket... Men den är helt klart läsvärd! Rekomenderas till alla paranormala läsare, och roligt att läsa min första bok av L.J. Smith utan vamyrer! The books in this series are just my guilty pleasure and I love reading them. Not a bad contribution to the 'Night World' series, though by no means the best. I have become obsessed with the night world book! this was as amazing as the others. So far each book is stand alone but the series is cohesive in content.